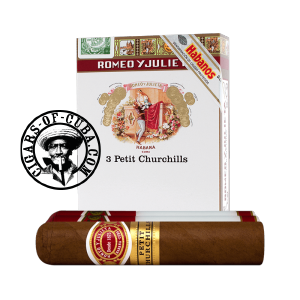 The new size from Romeo y Julieta and an addition to the famous RyJ Churchill series. The Petit Churchill is a fabulous little cigar that punches well above it's weight. The start of the cigar is familiar RyJ floral, leathery and roasted nutty aromas but it's the pace and intensity that surprises. This is a quick and very direct cigar that fills your palate with a concentrated burst. Tubos packaging is even better for taking your cigars out. Identical look to the rest of the Romeo y Julieta Churchill series, the Petit is a tastier version of his bigger brothers'. Tubos packaging for taking your cigars out. Roasted nuts, exotic fresh leather and fruity spiciness. Watch out for an intense finish on this little guy. Make catch you off guard.